Disaster preparedness implies the ability to respond quickly and effectively to any threat and emergency. How people react in an emergency situation depends largely depends upon how well they have been trained to respond to these emergencies. The faculty and staff of Greater New York Academy will be trained to respond appropriately to meet emergencies and provide students with the knowledge and practice they need to act wisely in such situations. Everyone will know what the dangers are and what actions should be taken to protect people and school property from the effects of danger. Check out our latest newsletter, we hope you enjoy. 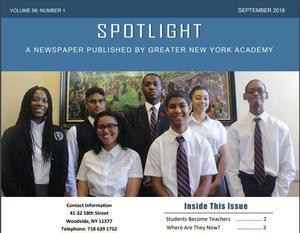 A quarterly newspaper published by Greater New York Academy. Students from Greater New York Academy hosted an Evangelistic series at the Maranatha Seventh-day Adventist Church. Here are photographic highlights of the series.